The BirdLife Partner and Species Guardian Aves Argentinas and local Patagonian NGO Ambiente Sur have begun a pioneering new project to save the Critically Endangered Hooded Grebe Podiceps gallardoi. This has involved teams of ‘Colony Guardians’ who monitor and protect breeding sites. Hooded Grebe Podiceps gallardoi breeds on a small number of lakes in the interior of Santa Cruz, extreme south-west Argentina, and winters on estuaries on the Atlantic coast of Santa Cruz. Declines of 80% have been detected for populations in on the main plateaus of Santa Cruz province, with some declines being up to 96% (Roesler et al. 2012a). The main threats are nest predation by an increasing population of Kelp Gulls Larus dominicanus, predation of adults by introduced American Mink (Roesler et al. 2012a, Roesler et al. 2012b), and predation and competition for food resources from alien Rainbow Trout (Roesler et al. 2012a, Roesler et al. 2012b). 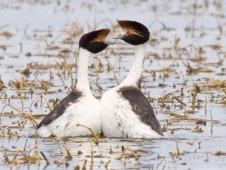 Conservation action is now underway to address these threats, led by Aves Argentinas (BirdLife in Argentina and Species Guardian for the grebe), and a local organisation, Ambiente Sur, who are working together to prevent the extinction of Hooded Grebe. They have carried out surveys that recorded over 700 individuals, and collected data on introduced mink. “Colony Guardians” have been established to work with local communities. These are local people assigned to protect nests from predators, and to collect breeding data. Their efforts have improved survival rates at a number of colonies. Most importantly, a National Park encompassing much of the grebe’s breeding habitat has been declared, and a law passed to ban introduction of trout into the lakes. BirdLife Community Post: A last chance for High Andean Grebes? Roesler, I., Imberti, S., Casaṅas, H., Mahler, B. and Reboreda, J. C. (2012a) Hooded Grebe Podiceps gallardoi population decreased by eighty per cent in the last twenty-five years. Bird Conserv. Int. 22:371–382. Roesler, I., Imberti, S., Casanas, H. and Volpe, N. (2012b) A new threat for the globally Endangered Hooded Grebe Podiceps gallardoi: the American mink Neovison vison. Bird Conserv. Int. 22: 383–388. Lancelotti, J. L., Bandieri L. M. B. and Pascual, M. A. (2015) Diet of the exotic Rainbow Trout in the critical habitat of the threatened Hooded Grebe. Knowledge and Management of Aquatic Ecosystems 416: 26. Imberti, S. and Casañas, H. (2010) Hooded Grebe Podiceps gallardoi: extinct by its 50th birthday? Neotropical Birding 6: 66–71.